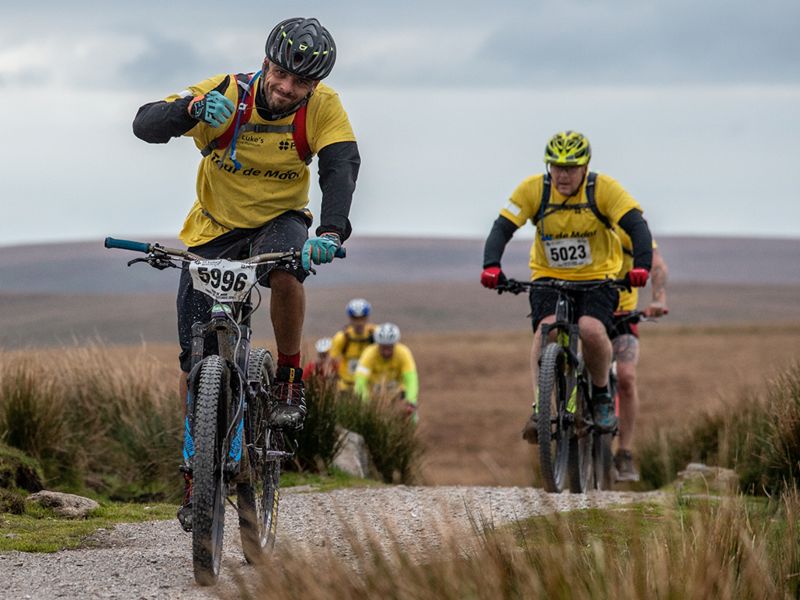 The hills and woods of Dartmoor were alive with mud, sweat and gears today, Sunday 30 September, as hundreds of people donned their yellow tee-shirts and got on their bikes in support of St Luke’s Hospice Plymouth. Once again, the charity’s annual Tour de Moor cycling challenge was a sellout, with adrenalin-seekers taking on the tough 23km route or the gruelling 52km route, putting their skills to the ultimate test by tackling the hills up to Princetown. Young families took part in their droves, too, following the more gentle 11km route along Drake’s Trail, enjoying ‘selfie’ stops, a hot chocolate and a quiz along the way. Sponsored by Print Copy Scan, a local supplier of printers and copiers, Tour de Moor provides for every level of cycling ability while raising vital funds that help St Luke’s extend its specialist end of life care to more people who desperately need it at home, in hospital and at the specialist unit at Turnchapel. Braving the 52km route was a father taking on the toughest challenge in memory of his beloved son. It was a poignant day for Chris Weir, 69, of Plympton, participating to support St Luke’s following their care for son Mark, who sadly passed away in January this year aged just 36, having been admitted to the specialist unit at Turnchapel over Christmas, following time in hospital. At Turnchapel, Mark was able to spend precious time with visiting family, including his children, who received support through St Luke’s Patches pre-bereavement programme for youngsters facing the loss of a parent. And riding the 23km route in memory of step-father Steve Mills – who passed way at the specialist unit three years ago – was Daniel White, who lives in Plymstock. Also taking part in the 23km were couple Dave and Jay Trestain from Padstow, Cornwall, cheered on by young daughter, Dora, and Dave’s mum, Jane. Dave, who is receiving treatment for cancer, was excited to be doing Tour de Moor for the second year and pleased the timing of the event fitted in after recent surgery. With Tour de Moor raising almost £100,000 last year and the event once again completely selling out this time, people of all ages rallied to make it a day to remember. Among them were five-year-old Jacob Cottam and dad Chris of Plympton, who took on the more gentle 11km route along Drake’s Trail. They heard about the annual event through Jacob’s school, Plymouth College, and were excited to be combining fitness with fundraising for St Luke’s. All the funds raised from today’s Tour de Moor will help the care St Luke’s gives everywhere from Salcombe to East Cornwall via Tavistock and the moors, supporting families as much as patients. 4 x 4 Response for their vital support, and the Plume of Feathers pub for help with facilities. Register your interest for Tour de Moor 2019.